Announcement Thank you so much for visiting my shop! If you have Instagram, please follow me at @mywildhaven for shop updates! All pieces are handmade with love in Goshen, Indiana! Thank you so much for visiting my shop! If you have Instagram, please follow me at @mywildhaven for shop updates! All pieces are handmade with love in Goshen, Indiana! I bought 2 of these beautiful air plant hangers as Christmas gifts, and both recipients are in love! Ashley’s work is gorgeous and she is wonderful to work with!! New listings up in the shop! Get them before they are gone! 2015 was an amazing year and I'm finally catching up on orders from right after my beautiful daughter was born! 2016 is going to be even better, so keep an eye out for brand new designs and make sure you check out my most popular design tagged here! Some new listings have officially been posted! More to come soon! Born in the raised in the Midwest, I've always been a lover of nature. The changing seasons throughout the year have always brought me great joy because of its constant ability to keep me changing and growing as a woman, wife, sister, and now mother. I started out my journey as an artist photographing weddings, families, and couples. I still do that from time to time and I find great joy in capturing the stories of those around me...the beauty, the messy, and the love. Every story is unique and deserves being captured. While living out my own story, I have come to love incorporating my obsession for nature into my home...a place where I spend a lot of time as an entrepreneur and stay at home/work from home mom. 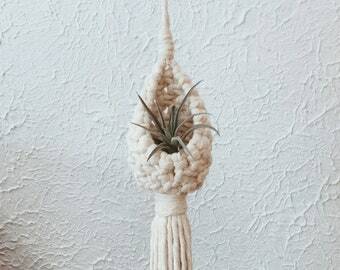 Whether that means hanging plants from the ceiling in every room or combining different fibers into a work of art, I found an outlet that I absolutely love in Macrame and Fiber art. This shop is where I experiment with these different forms of art and where I can hopefully bring some of that same joy and aesthetic to your own home. I am a mother of two by day (and all night) and an entrepreneur/artist located in Goshen Indiana. I specialize in macrame, fiber art, and weaving. My Wild Haven is a celebration of art, motherhood, and everything in-between.